"Tsingtao" redirects here. For the brewery, see Tsingtao Brewery. Qingdao ([tɕʰíŋtàu]; also spelled Tsingtao; Chinese: 青岛) is a major city in the east of Shandong Province on China's Yellow Sea coast. It is also a major nodal city of the One Belt, One Road (OBOR) Initiative that connects Asia with Europe. It has the highest GDP of any city in the province. Administered at the sub-provincial level, Qingdao has jurisdiction over six districts and four county-level cities. As of 2014[update], Qingdao had a population of 9,046,200 with an urban population of 6,188,100. Lying across the Shandong Peninsula and looking out to the Yellow Sea, it borders Yantai to the northeast, Weifang to the west and Rizhao to the southwest. Qingdao is a major seaport, naval base, and industrial centre. The world's longest sea bridge, the Jiaozhou Bay Bridge, links the main urban area of Qingdao with Huangdao district, straddling the Jiaozhou Bay sea areas. It is also the site of the Tsingtao Brewery, the second largest brewery in China. In 2018, Qingdao ranked 31st in the Global Financial Centres Index published by the Z/Yen Group and China Development Institute, the other Chinese cities on the list being Hong Kong, Shanghai, Beijing, Shenzhen, Guangzhou, Tianjin, Chengdu, Hangzhou and Dalian. In 2007, Qingdao was named as one of China's top ten cities by the Chinese Cities Brand Value Report, which was released at the 2007 Beijing Summit of China Cities Forum. In 2009, Qingdao was named China's most livable city by the Chinese Institute of City Competitiveness. In 2018, Qingdao held the Shanghai Cooperation Organization summit. Jiāo'ào: (胶澳): former name during the Qing dynasty. Jiaozhou: a historical name which refers to the Jiaozhou Bay. Human settlement in the area dates back 6,000 years. The Dongyi nationality, one of the important origins of the Chinese nation, lived here and created the Dawenkou, Longshan and Dongyeshi cultures. In the Eastern Zhou Dynasty (770 B.C. – 256 B.C. 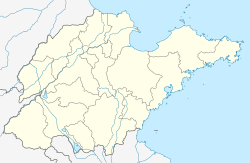 ), the town of Jimo was established, which was then the second largest one in the Shandong region. The area in which Qingdao is located today was named Jiao'ao (胶澳) when it was administered by the Qing Dynasty on 14 June 1891. In 1891, the Qing Empire decided to make coastal Tsingtao (Jiao'ao) a defense base against naval attack and began to improve its fortifications. Imperial German naval officials observed and reported on this activity during a formal survey of Jiaozhou Bay in May 1897. Subsequently, German troops seized and occupied the fortification. The unmodernised and ineffective Qing Empire was forced to concede the area to Germany the following year, and the Kiautschou Bay concession, as it became known, existed from 1898 to 1914 (Li 2005, p. 81). With an area of 552 square kilometres (136,000 acres; 213 sq mi), it was located in the imperial province of Shandong (alternately romanised as Shantung or Shan-tung) on the southern coast of the Shandong Peninsula in northern China. Jiaozhou was romanised as Kiaochow, Kiauchau or Kiao-Chau in English and Kiautschou in German. Qingdao was its administrative center. "The so-called Marktstrasse (Market street) was nothing more than the old main street of the Chinese village of Tsingtao, and the buildings lining it were the former homes of fishermen and farmers. Having sold their property, they resettled their homes and fields in the villages further east." Upon gaining control of the area, the Germans outfitted the impoverished fishing village of "Tsingtao" (Qingdao) with wide streets, solid housing areas, government buildings, electrification throughout, a sewer system and a safe drinking water supply, a rarity in large parts of Asia at that time and later. The area had the highest school density and the highest per capita student enrollment in all of China, with primary, secondary and vocational schools funded by the Imperial German treasury and Protestant and Roman Catholic missions. Commercial interests established the Germania Brewery in 1903, which later became the world-famous Tsingtao Brewery. German cultural and commercial influences extended to other areas of Shandong Province, including the establishment of diverse commercial enterprises. Identified by the German authorities as a strategically important port, Qingdao was administered by the Imperial Department of the Navy (Reichsmarineamt) rather than the Imperial Colonial Office (Reichskolonialamt). The growing Imperial German Navy based their Far East Squadron there, allowing the warships to conduct operations throughout the western Pacific. Beginning January 1898, the marines of III. Seebataillon were based at Tsingtao. Construction of the Jiaoji Railway began on September 23, 1899, and was completed in 1904. Before the outbreak of World War I (1914-1918), ships of the German naval forces under Admiral Count von Spee were located at central Pacific colonies on routine missions. The fleet then rendezvoused in the Marianas Islands to plan a transit back to Germany rather than be trapped in the Pacific by more powerful and numerous Allied fleets (British and Japanese). After a minor British naval attack on the German colony on Shandong in 1914, Japanese Empire troops occupied the city and the surrounding province during the Siege of Tsingtao after Japan's declaration of war on Germany in accordance with the Anglo-Japanese Alliance. China protested Japan's violation of her neutrality but was not able to interfere in the military operations. The decision of the Paris Peace Conference and the Versailles Treaty negotiations not to restore Chinese rule over the previous foreign concessions in Qingdao after the Great War triggered the May Fourth Movement (May 4, 1919) of anti-imperialism, nationalism and cultural identity in China. The city came under Chinese rule in December 1922, under control of the Republic of China (R.O.C.) established 1912 after the Chinese Revolution the year before. However, Japan maintained its economic dominance of the railway and the province as a whole. The city became a direct-controlled municipality of the ROC Government in July 1929. Japan re-occupied Qingdao in 1938, a year after its expansion of the Second Sino-Japanese War (1937-1945), (a precursor to World War II, 1939-1945) with its plans of territorial expansion into China's coast. Nationalist (Kuomintang) ROC forces returned after the Japanese surrender in September 1945. On June 2, 1949, shortly before the founding of the communist People’s Republic of China on October 1, 1949 the city was taken by Chairman Mao Zedong and his troops. The development of the Tsingtao urban space during the German-occupation (1891–1914) originated from the port. Mass urban construction began in 1898 with the relocation of Chinese dwellers along the coast. With the completion of such series of projects as wharves, Tsingtao-Jinan Railway Line, Tsingtao Railway Station and locomotive works, a city was starting to take shape. The area had the highest school density and highest per capita student enrolment in all of China, with primary, secondary and vocational schools funded by the Berlin treasury and Protestant and Roman Catholic missions. In 1910, the Germans drew up for the second time the city planning of Tsingtao (Warner 2001, p. 33). The former urban area was extended for four times highlighted by the emphasis on the development of commerce and trade. Sun Yat-sen (1866–1925), leader of the Chinese Revolution of 1911 and subsequent first president of the Republic of China, visited the Tsingtau area and stated in 1912, "I am impressed. The city is a true model for China's future". After World War II the KMT allowed Qingdao to serve as the headquarters of the Western Pacific Fleet of the US Navy in 1945. On 2 June 1949, the CCP-led Red Army entered Qingdao and the city and province have been under PRC control since that time. Since the 1984 inauguration of China's open-door policy to foreign trade and investment, western Qingdao developed quickly as a port city. It is now the headquarters of the Chinese navy's northern fleet. An early example of the open-door policy occurred on 5 November 1984, when three United States Naval vessels visited Qingdao. This was the first US port call in more than 37 years to China. USS Rentz, USS Reeves, and USS Oldendorf and their crews were officially hosted by the Chinese People's Liberation Army Navy (PLAN). 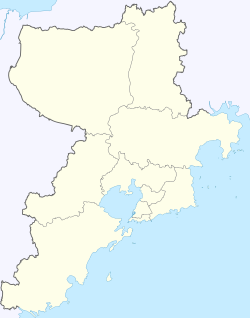 Geographically, there are four districts (Shinan, Shibei, Licang and Laoshan) constituting a peninsula on the east coast of the Jiaozhou Bay as the core urban area, one (Chengyang) on the north coast and one (Xihai'an) on the west coast of the Yellow Sea. Qingdao is located on the south facing coast of the Shandong Peninsula (German: Schantung Halbinsel). It borders three prefecture-level cities, namely Yantai to the northeast, Weifang to the west, and Rizhao to the southwest. The city's total jurisdiction area occupies 10,654 square kilometres (4,114 sq mi), and stretches in latitude from 35° 35' to 37° 09' N and in longitude from 119° 30' to 121° 00' E. The populated sections of the city are relatively flat while mountains spur up within city limits and nearby. The highest elevation in the city is 1,133 metres (3,717 ft) above sea level. Of the total area of Qingdao, 15.5% is highland, while the foothill, plain and lowland areas constitute 25.1%, 37.8% and 21.7%. The city has a 730.64 kilometres (454.00 mi) coastline. Five significant rivers that flow for more than 50 kilometres (31 mi) can be found in the region. Qingdao has a temperate, four-season, monsoon-influenced climate that lies in the transition between the humid subtropical (Köppen Cwa) and humid continental (Köppen Dwa) regimes, but favouring the former. Winter is cool to cold and windy, but generally dry, with a January average of −0.2 °C (31.6 °F). Summer is generally hot and humid, but very hot days are rare, with an August average of 25.4 °C (77.7 °F). Due to its proximity to the coast and being on a peninsula, it experiences a one-month delayed spring compared to most inland areas of China, and the annual diurnal temperature variation is only 6.3 °C (11.3 °F). Conversely, autumn is milder than inland areas in Shandong. The water temperature peaks at about 25 °C (77 °F) in late August, with swimming possible two months on either side. The annual mean temperature is 13.0 °C (55.4 °F). Extremes since 1951 have ranged from −15.5 °C (4 °F) on 16 January 1958 to 38.9 °C (102 °F) on 15 July 2002. During the summer months, the beaches of Qingdao are afflicted by massive algal blooms. The decomposing algae release large amounts of hydrogen sulfide gas, which gives off the odour of rotten eggs. The blooms of sea lettuce, which are partially caused by seaweed farming in Jiangsu Province, led local officials to declare a "large-scale algae disaster" in 2013. By the end of 2006, Qingdao was estimated to be the home of about 8 million inhabitants, of which around 3 million reside in the Qingdao urban area. Another estimated 5 million live in other cities under Qingdao's jurisdiction. The annual birth rate is calculated around 76,507, with a birth rate of 10.15 per year per thousand, and a death rate of 6.32, both calculated on an annual basis. Living standards are among the highest of leading Chinese cities due to the strong export economy and relatively high family wages. Qingdao is home to 38 Chinese ethnic minorities, which account for 0.14% of the city's total population. Internationally, Qingdao is perhaps best known for its Tsingtao Brewery, founded by a German-British joint venture in 1903 that produces Tsingtao beer, the best-known Chinese export beer. It is also home to Haier, a large white goods manufacturer, and Hisense, a major electronics company. In 2002 guitar manufacturers Epiphone opened a factory in Qingdao. In 1984 the Chinese government named a district of Qingdao a Special Economic and Technology Development Zone (SETDZ). Along with this district, the entire city had gone through amazing development of secondary and tertiary industries. As an important trading port in the province, Qingdao flourishes with foreign investment and international trade. South Korea and Japan in particular made extensive investment in the city. Approximately 80,000 South Korean citizens reside there. Construction proceeds at a relatively Template:Weasal-inline fast pace in Qingdao. In terms of primary industry, Qingdao has an estimated 50,000 acres (200 km2) of arable land. Qingdao has a zigzagging pattern coastline, and thus possesses an invaluable stock of fish, shrimp, and other sea resources. Qingdao's wind power electricity generation performs at among the highest levels in the region. On June 30, 2011, the longest bridge over water opened in Qingdao. The bridge, Haiwan Bridge, is 26.4 miles (42.5 km) long and connects Qingdao to an offshore island, Huangdao. It would easily cross the English Channel and is almost three miles (4.8 km) longer than the previous record-holder, the Lake Pontchartrain Causeway in the American state of Louisiana. Haiwan Bridge is supported by more than 5,000 pillars and costs about 10 billion yuan which is about 1.5 billion dollars. The bridge was designed by the Shandong Gausu Group and the construction lasted for four years. Haiwan Bridge cut the commute between the city of Qingdao and the sprawling suburb of Huangdao by 30 minutes. At least 10,000 workers toiled in two teams around the clock to build the bridge, which was constructed from opposite ends. On the same day, the Jiaozhou Bay Tunnel opened. The tunnel brought much convenience to people by supporting public buses and making transport between the two areas more convenient. Qingdao (official name: Qingdao port international co. ltd.) hosts one of the world's busiest seaports. Cooperative relations have been established with 450 ports in 130 countries worldwide. In 2003, the annual cargo handling capacity exceeded 100 million tons for the first time. The number of containers reached 3.41 million twenty-foot equivalent units (TEU) of cargoes. By 2011, the port had become the world’s sixth-busiest by Total Cargo Volume, having handled 372 million tonnes of cargo in that year. As of 2016, it was the 8th in the world in terms of TEUs (Twenty Foot Equivalent Units). The Orient Ferry connects Qingdao with Shimonoseki, Japan. There are two ferry lines connecting Qingdao with South Korea. The New Golden Bridge II operates between Qingdao and Incheon, and the Blue Sea Ferry operates between Qingdao and Gunsan. The Qingdao Liuting International Airport, 23 km (14 mi) away from city centre, is served by 13 domestic and international airlines, operating 94 routes, 12 of which are international and regional. In 2011, Qingdao Liuting International Airport was the 16th busiest airport in the People's Republic of China with 11,716,361 passengers. A new civil aviation airport with much larger capacities will be built in Jiaozhou District. Qingdao's railway development was picked up during the late 1990s. It is at the beginning of the Jiaoji Railway. Qingdao's city proper has some major railway stations, Qingdao Station, Sifang Station, Cangkou Station, Great-Seaport Station, etc. Qingdao's public traffic owns 5283 large and medium-sized buses, CNG buses as of 2012[update].There are also 136 trolleybuses as of 2012[update]. All of the buses and trolleybuses can be accessed using the Qingdao Public Traffic IC Card (青岛卡), which uses radio frequencies so the card does not have to physically touch the scanner. Non air-conditioned busses cost 1 yuan, The volume of road passenger transport approaches 0.8 billion per year. [citation needed] The Public Transport Brand of 'Ri-Xin Bus (日新巴士)' is also known in China. After getting the approval from the State Council, the government announced on 18 August 2009 that Qingdao is ready to spend more than 29 billion yuan ($4.2 billion) before 2016 on its subway construction. Construction of 54.7 km (34.0 mi) of subway line will be completed before 2016 with a total investment of 29.2 billion yuan ($4.3 billion). Metro Line 3 is the first line in function and opened on 16 December 2015. In the long term, the city plans to build eight subway lines in downtown and some suburban districts, which account for 231.5 km (143.8 mi) in future. As of end of 2018, the system has an operating length of 170 km (110 mi), lines in operation including Line 2, Line 3, Line 11, and Line 13. Qingdao is headquarters of the North Sea Fleet of the People's Liberation Army Navy. There is a large number of German-style buildings in Qingdao city centre, remarkable considering the German colonial period only lasted 16 years (1898–1914). The unique combination of German and Chinese architecture in the city centre, combined with German demographic roots and a large Korean expatriate population, gives Qingdao a distinct atmosphere. An old saying described Qingdao as a city of "red tiles green trees, blue sky and blue sea." This saying indeed gives a picture of bird view of Qingdao. A larger number of areas in former foreign styles are well preserved. Although the new city area is under large-scale reconstruction, the old city area (especially the western part of Shinan District) still retains many traditional buildings. During the city's colonial days, German was the official language and rigorously taught and promoted. Since the demise of Germany's colonial empire during World War I, the German language is virtually dead here and left little impact on the local languages. A local accent known as Qingdao dialect (青岛话, pinyin qingdao hua) distinguishes the residents of the city from those of the surrounding Shandong province. Due to the efforts by the city government to promote standard Mandarin, most educated people can speak standard Mandarin in addition to their native dialect. With reform policies and English teaching, some young citizens have been taught English and many can converse with English-speaking foreigners. Business and traffic signs in English are becoming more and more common. Seafood is a typical delicacy of the coastal city, divided into two categories: "Great Seafood" including sea cucumbers, abalones, shark's fin, prawns, crabs, conch, and some big fish, and "Little Seafood" comprising squid, shrimps, octopus, oysters, razor clams, clams, periwinkles, yellow croakers, etc. The distinctive cuisine of the area is Lu Cai, the Shandong regional style. Qingdao International Horticultural Exposition 2014 is the biggest international fair that has been held in the history of the city. Qingdao previously had a large German community and a German garrison, so three German newspapers operated in Qingdao. German papers included Deutsch-Asiatische Warte (T: 泰東古今鑑, S: 泰东古今鉴, P: Tàidōng Gǔjīn Jiàn; weekly newspaper published until 1906, included Die Welt des Ostens, Altes und Neues aus Asiens drei Kaiserreichen, a cultural supplement), the Tsingtauer Neueste Nachrichten and the Kiautschou Post (a daily paper published from 1908 to 1912, referring to the Kiautschou (Jiaozhou) Bay concession). German publishing in Qingdao ended after World War I and the beginning of the Japanese administration. A 1912 publication of the United States Department of Commerce, Bureau of Foreign and Domestic Commerce said that the Tageblatt für Nordchina of Tianjin was read in Qingdao, and that major newspapers from Shanghai were also read in Qingdao. Ba Da Guan (Eight Great Passes, 八大关), the older area of town with some surviving German and Japanese architecture. Lu Xun Park, named after Lu Xun (鲁迅), modern Chinese writer and critic, who lived and taught in the 1930s. Zhongshan Park, named after the style name 'Zhongshan' of Sun Yat-sen (孙文，字中山), a famous modern Chinese politician. The twin-spired St. Michael's Cathedral (Kathedrale St. Michael) (天主教堂), one piece of the famous Neo-romanesque architecture in Qingdao, designed by German architect Alfred Fräbel, completed in 1934. Tsingtao Brewery (Tsingtao-Brauerei), founded by Germans and the most exported beer from China. Zhanshan Temple (Dschanschan-Tempel), Qingdao's oldest Buddhist temple. Lao Shan (Mount Lao, Lauschan, 崂山), 40 km (25 mi) east of Qingdao, the most famous Taoist mountain with Taoist retreat – Great Purity Palace (太清宫). Jiaozhou Governor's Hall (Gouverneurspalast), former seat of the present and previous two governments. Qingdao Binhai University, located at Huangdao. Shandong University was located in Qingdao from 1909 to 1936. A new branch campus of the university is under construction in Aoshanwei Town, Jimo. Along with Beijing's hosting of the 2008 Summer Olympics, Qingdao was the host city for the Olympic Sailing competitions which took place along the shoreline by the city. These events were hosted at the Qingdao International Sailing Centre and held in Fushan Bay, near the city's central business district. A hotel and an international broadcasting centre were built. Qingdao is recognized as one of the "football cities" in China, due to dozens of preeminent players it trained like Qu Bo, Zheng Long, Yu Dabao, Liu Jian and Jiang Ning .However, due to lack of money of the sponsors of football clubs in Qingdao, its football potential has reduced. Qingdao Jonoon F.C. (previously named Qingdao Hainiu Football Club) was founded in 1993. It is one of the founding members of the second-division of Chinese professional football league. They got the championship in their first season in 1994 and were promoted to the Chinese Jia-A League. In 1995, they finished 11th (out of a total 12 teams) and were relegated from the top league. Only one year later, after finishing as runner-up in the second-division, they returned to the top league. They have been part of Chinese Super League from its inauguration in 2004.In 2013, they were relegated to the China League One and in 2016 relegated to the China League Two. Qingdao Huanghai F.C. was established on 29 January 2013. In their first season in the Chinese Football Association Division Two League, they finished the first in league and got to the China League One. Up to June 13, 2016, they had been on the first and had a great chance to get into the Super League after the season. Fans in China called them "Chinese Barcelona". Qingdao DoubleStar Eagles is a Chinese professional basketball team which plays in the North Division of the Chinese Basketball Association. Qingdao Renzhou Badminton Club is a Chinese badminton club which plays in the China Badminton Super League. Qingdao Clipper is a professional arena football team which is a member of the China Arena Football League(CAFL). The IndyCar Series signed a contract with the Qingdao city council to hold an IndyCar race in Qingdao in 2012. The race was supposed to take place on a 6.23 km (3.87 mi) street circuit but it was cancelled. Miscellaneous series, Issues 7–11. United States Department of Commerce, Bureau of Foreign and Domestic Commerce, 1912. Walravens, Hartmut. "German Influence on the Press in China". In: Newspapers in International Librarianship: Papers Presented by the Newspaper Section at IFLA General Conferences. Walter de Gruyter, January 1, 2003. ISBN 3110962799, ISBN 9783110962796. Also available at ( () the website of the Queens Library – This version does not include the footnotes visible in the Walter de Gruyter version. Also available in Walravens, Hartmut and Edmund King. Newspapers in international librarianship: papers presented by the newspapers section at IFLA General Conferences. K.G. Saur, 2003. ISBN 3598218370, 9783598218378. ^ "2017中国青岛青岛概况 - 中文 - 青岛之窗 - 让青岛走向世界，让世界了解青岛". www.qingdaochina.org. Retrieved 2019-03-04. ^ 中央机构编制委员会印发《关于副省级市若干问题的意见》的通知. 中编发5号. 豆丁网. 1995-02-19. Archived from the original on 29 May 2014. Retrieved 2014-05-28. ^ A bridge too far? China unveils world's longest sea bridge which is five miles FURTHER than the Dover-Calais crossing | Mail Online. Dailymail.co.uk. Retrieved on 2011-08-28. ^ "China Beer" (PDF). Retrieved 2013-06-13. ^ "The Global Financial Centres Index 24" (PDF). September 2018. Retrieved 31 December 2018. ^ "China's Top 10 Most Livable Cities". hnloudi.gov.cn. Hunan Loudi Official Government. 28 March 2012. Archived from the original on 10 April 2013. Retrieved 18 June 2014. ^ "List of 10 Most Livable Cities in China Issued". 2009-07-09. Retrieved 2010-12-18. ^ Lin Liyao (蔺丽瑶) (2011-07-27). "Top 10 livable cities in China 2011". China.org.cn. Retrieved 2012-09-10. ^ "China Focus: What to expect from SCO summit in Qingdao". Xinhua. Retrieved 2018-06-29. ^ Matzat, Wilhelm (May 2003). "Landmann Gottfried 1860–1926 Uhrmacher, Optiker, Bierbrauer" [Gottfried Landmann, 1860–1926: Watchmaker, Optician, Beer Brewer]. tsingtau.org (in German). Wilhelm Matzat. Retrieved 2010-06-09. ^ Matzat, Wilhelm (May 2003). "Germania Brauerei und ihre Angestellten 1903–1914" [Germania Brewery and its Employees]. tsingtau.org (in German). Wilhelm Matzat. Retrieved June 9, 2010. ^ 斯, 李. 1904年06月01日 胶济铁路通车. www.todayonhistory.com. Retrieved 1 September 2014. ^ Duffy, Michael (22 August 2009). "Primary Documents – Count Okuma on the Japanese Capture of Tsingtao, 15 August 1914". firstworldwar.com. Retrieved 28 July 2014. ^ "Germans lose possessions in China". The Independent. Nov 16, 1914. Retrieved July 24, 2012. ^ Toyokichi Iyenaga (Oct 26, 1914). "What is Kiaochou worth?". The Independent. Retrieved July 24, 2012. ^ a b 中国气象数据网 - WeatherBk Data. China Meteorological Administration. Retrieved 2018-11-09. ^ Jacobs, Andrew (July 5, 2013). "Huge Algae Bloom Afflicts Coastal Chinese City". The New York Times. ^ "Climatological Normals of Qingdao". Hong Kong Observatory. Retrieved 2010-04-10. ^ "Gibson Qingdao Factory – All Epiphone... All The Time!". Epiphone.com. Retrieved 24 February 2012. ^ Gardiner, Ginger. "High Wind in China". www.compositesworld.com. Retrieved 2017-05-27. ^ 中国公路信息服务网－公路地图 (in Chinese). 中国公路信息服务网. Archived from the original on 16 January 2013. Retrieved 12 January 2013. ^ Eimer, David (8 January 2011). "China builds world's longest bridge". London: The Telegraph. Retrieved 2013-03-23. ^ Qingdao port sees upsurge in cargo handling capacity. People's Daily. Retrieved on 2012-11-12. ^ Ferries Korea-China. Seat61.com. Retrieved on 2012-11-12. 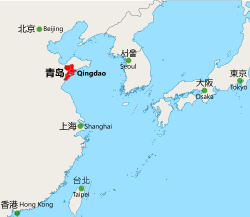 ^ "New Qingdao Airport Location Confirmed". World Civil Aviation Net. 29 September 2013. Archived from the original on 29 October 2013. ^ 列车时刻 (in Chinese). Qingdao railway station. Archived from the original on 8 January 2013. Retrieved 12 January 2013. ^ "$4.3 billion budget to boost Qingdao subway construction". 2008-08-19. ^ United States Bureau of Foreign and Domestic Commerce, p. 188. "Tageblatt für Nord China, a German paper published in Tientsin, and the leading papers published in Shanghai are also largely read in Tsingtau." ^ IndyCar (10 November 2011). "INDYCAR: Series Confirms China Race". SPEED Channel. Fox Sports. Archived from the original on 13 November 2011. Retrieved 11 November 2011.